A community is still mourning the passing of a beloved man who was shot and killed Wednesday at a home near Bailey. 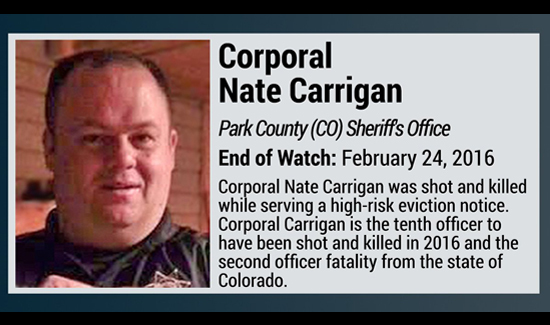 Corporal Nate Carrigan was among the three deputies shot while serving a high-risk eviction notice. Carrigan died. He was a 13-year veteran of the Park County Sheriff’s Office. His two partners, Master Patrol Deputy Kolby Martin and Captain Mark Hancock, survived. Martin was taken to St. Anthony Hospital after being shot several times in the lower extremities in critical condition. As of Thursday morning, Martin was listed in serious condition. Hancock’s ear was grazed, so he was released from the hospital. Thursday afternoon, the Park County Sheriff’s Department held a press conference, thanking the community for their thoughts and prayers during this difficult time. Wegener read a statement from Carrigan’s family. In the statement, Carrigan’s family hoped his death didn’t discourage people from becoming law-enforcement. Wegener reminded the public that the deputies considered this a high-risk eviction notice based on previous law-enforcement contact with the resident involving Jefferson County deputies. Wegener noted they had served a similar eviction notice to the shooter back in 2014 and came to a peaceful resolution.